We make them all day long, every single day. Some, without thinking about it. Others, we agonize over and over think. Lots of little choices add up to a big choice - to love your life. Man, am I learning something about this! I had a lesson in it yesterday, in fact. I woke up and took the dogs out. 100% normal. I came back inside to make coffee. 100% normal. But then I realized that Michael was sitting up in bed, fully awake. 100% not normal. I like to have some quiet time alone before helping him. This little tweak in our "normal" sent me on a roller coaster of anger and discontent. I fought it, trying to reign in my unglued emotions. I got him up and half way dressed, while having a horrible attitude. Then, he served me. He rubbed my aching back, and showed me how to do this. How to love first thing in the morning, when you're tired, and you haven't taken care of yourself yet. And, it turned my day around. When I was at Allume in October, I met the ladies from iBloom. 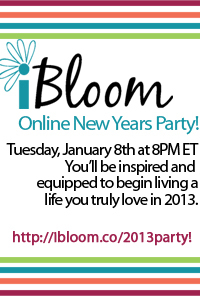 iBloom is a Christian life coaching company. Their mission is to help women live lives of passion, balance, purpose and fulfillment. That sure sounded good to me, so I signed up! Now, I'm an iBloom Ambassador. iBloom will help equip you in each of those areas (passion, balance, purpose, and fulfillment) so that you can choose to love the life that you live. It's a one year journey, and this book, iChoose2 Love My Life, is your guide. I'm taking this journey this year, myself. If you'd like to join me, I'd love to connect, and go through the book together! If you go to the iBloom website and sign up, registration and weekly videos are FREE! The book is about $10. Here's the deal. If you want to join me in this journey, COMMENT below. I will buy one person a book, and have it mailed to you! I will choose this winner randomly, from the comments. iChoose2 Love My Life will give you a theme to work on each week. And it's written in a way that you pace yourself. For example, one week we will focus on being grateful, then forgiveness, being optimistic... you get the picture. There are 52 of these themes. I know I need this book. I know that a new year, starting a new job, and moving to a new town is the perfect opportunity for a little self-assessment. I don't know about you, but I always have areas of my life that need to be worked on! Here's a cool way that you can join in with a bunch of other women also going on this journey in 2013. We're having a PARTY! You're all invited. It's Tuesday, January 8th at 8:00pm Eastern. Click that link back there to register, it's free! Remember, if you want a free book, as a GIFT from me, comment below, and I'll buy you a book! I would like to join you with this!! Awesome! I would join you in it too.